This is my father’s memoir which he dictated into a tape recorder 35 years ago. I have tried to be as true to his recording and words as possible. There are places in his tapes when the recording fails and I have had to surmise specific words based on what I know from him and from history. In 1906, I was born in a little village called Shekh Hadji  in Kharpert which was one of the six Armenian provinces of the Ottoman Empire, a part of ancient Armenia. I lived there until I was eight years old. My village was divided into two communities. One was Turkish and the other was Armenian. We lived in separate quarters which today would be called a ghetto. It was not an official policy, it just worked out that way as far as I know. Our churches and schools were there – in the Armenian part. It was just natural for the Armenians to be within themselves and the Turks in their own quarters where their prayer places were. My mother’s family name was Mateosian. Her parents, David and Altoun, had four children – my mother, Elizabehth, another daughter Arshalous, and two sons, Mateos and Mardiros. As a young man, Mateos went to the United States as did my father and many other young Armenian men. They went to work or get better educated and most planned to return. When Mateos returned, he obtained a job in the large German orphanage in Mezreh (today called Eläzig). 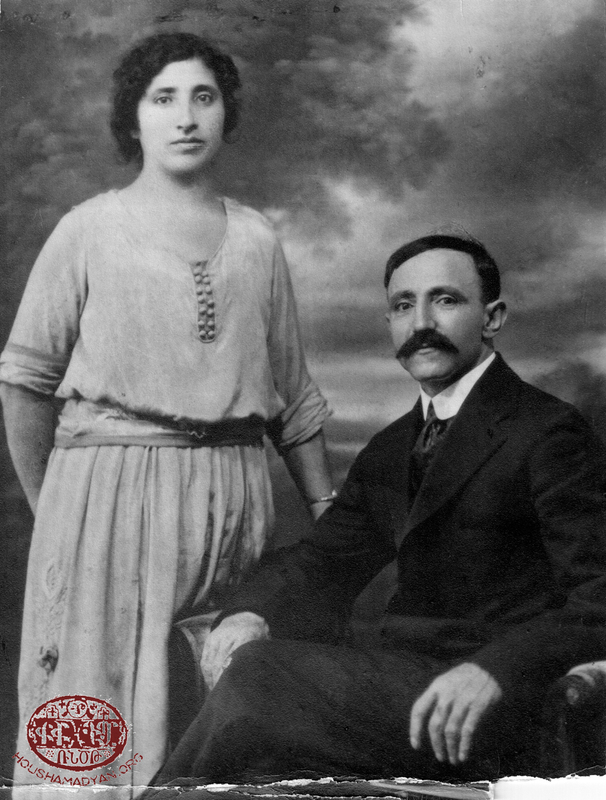 Mardiros and Arshalous also settled in Mezreh after they were married. Mezreh had 16,000 inhabitants at the time, and was situated in the valley below the city of Kharpert which had about 20,000 inhabitants. Mezreh was built on two sides of what was the post road -- the only road that ran east to west through the great plains of the region. Kharpert was built up high overlooking the plains, an old fortress town from ancient times. 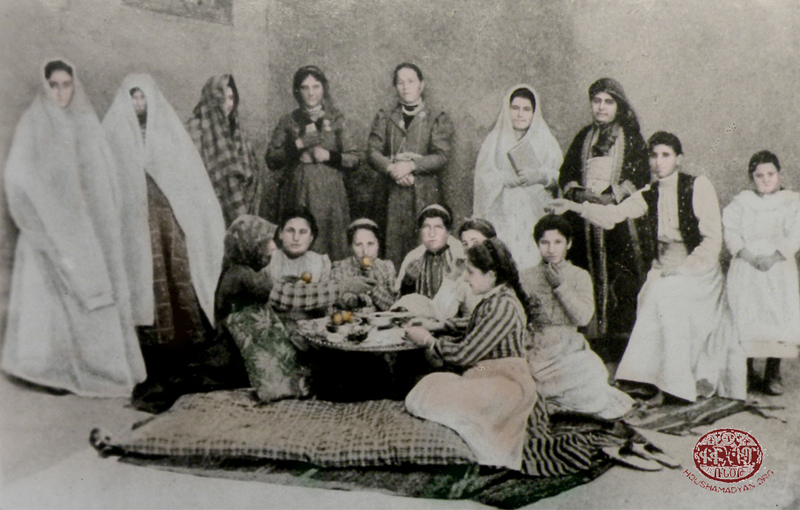 American missionaries came to Kharpert in the mid 1800s and began establishing schools and colleges, including Euphrates College where many young Armenian men and women received higher education. French missionaries and German missionaries also came and established their own schools and colleges, hospitals and orphanages. These were all in addition to the many Armenian Apostolic church educational institutions which were there. Kharpert and the surrounding region became a center of education and began a great awaking as well as period of self-discovery in many young Armenians. 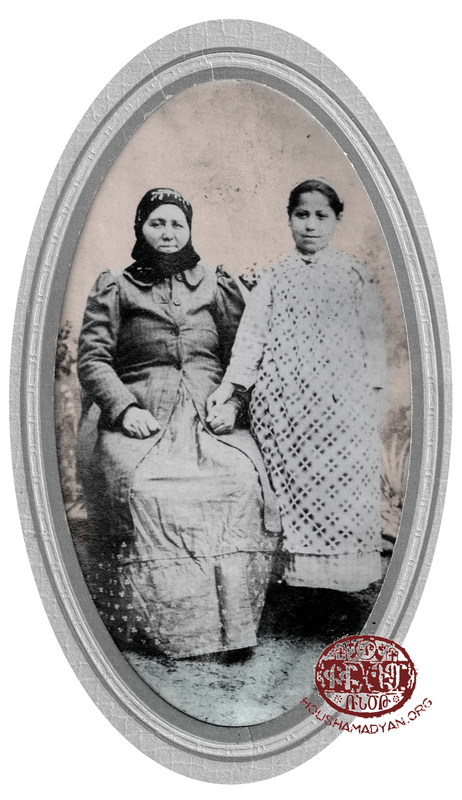 When I think about Shekh Hadji vivid thoughts of my grandmother, Anna Badji (means sister in Turkish)  come to mind. She was quite a woman who was able to do almost anything. She could sit at a loom and weave. She could do all kinds of pottery work. When broken utensils made of pottery were brought to her she would repair them. She would go into the fields and bring in whatever was needed. She would deal with all of the chores because there was no man in the house. 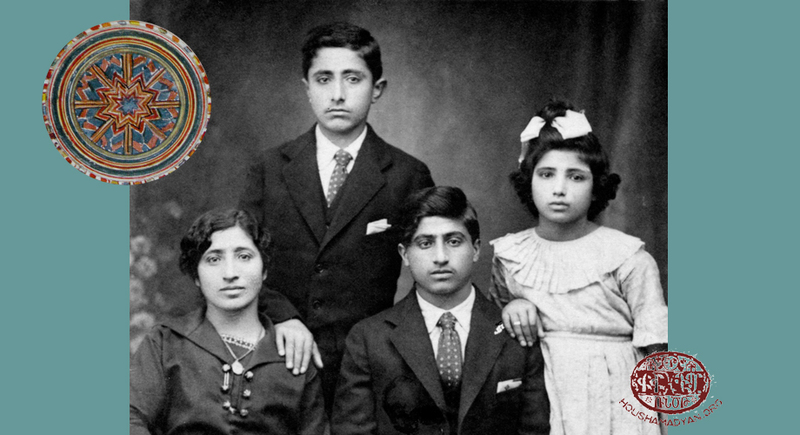 Since her husband was dead and my father, her only son, had gone to the United States, my grandmother was responsible for our family – her daughter-in-law and her three grandchildren. She was smart, strong, and fearless. My father told me a story which showed her courage. My father was cornered in one of the isolated areas around our village by some Turkish boys who severely beat him. He had all kinds of bruises up on his body when he came home. When my grandmother saw his condition she got furious and wanted to know what had happened. After learning the facts, she went straight to the same place, found those boys, and beat every one of them. One boy was so badly marked up that when he went home his father demanded to know what had happened to him. The boy told him that Anna Badji had beaten him up. The whole village including the Turks knew my grandmother as Anna Badji. The Turk brought his son to our house and knocked at the door. He called for Anna Badji. My grandmother went over to him and asked, “What’s the matter?” The Turk began to holler and shouted, “How dare you do this:” He threatened her. She brought my father over and showed the Turk the marks on his body and said, “If you don’t get going from here and get lost, I will do the same thing to you that I did to your son.” The Turk, without a word, turned around and left. My mother came from a pretty well-to-do family. Her brothers were successful builders, whereas my father was considered an orphan because he had no father, only a mother and hardly any other relatives. Years later, when I was talking to my mother’s sister, Arshalous, she told me, “The only reason your mother was allowed to marry your father was because your grandmother was seen as courageous, versatile, sincere, and clever. If she had been in a country like the United States with some education, she would have been a great woman, maybe a government official or she might have done something great.” She was outspoken and capable of doing almost any job – she left that kind of an impression on all of us. 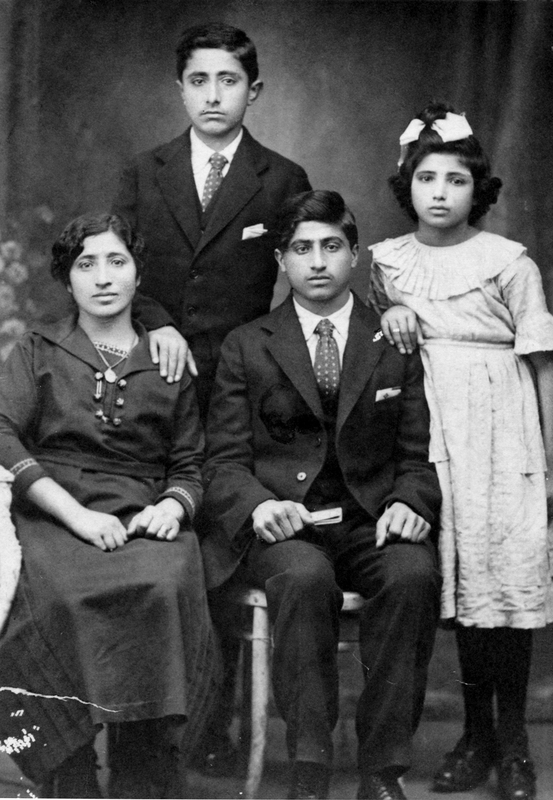 My father did have an uncle and a few cousins who lived in Shekh Hadji. His uncle, Hampartzum Margosian (my grandmother’s brother) had gone to the United States and returned after a number of years. He was, to me, a superman! He dressed differently, talked differently, and had many stories to tell. For hours, he would sit and tell me stories about cops and robbers – and I was fascinated by it all. I’m sure my brother and sister felt the same way. He had a good education (as we knew) and was a teacher in the Apostolic Church school. I remember when he married a young woman who also became a teacher. As for my father, he was able to make a good living for us with his trade of saddle making. As I understood it, he always went where there was work. He would go from village to village and then come back home. My father was an ambitious man and had thoughts of starting something on a much greater scale with a larger amount of capital. So he decided to leave his family and go to the United States as was common at that time – to earn some money fast, return home, and start a new venture. Now his leaving was based on an explicit understanding with my mother that he was to stay in the United States for only three years. But, his dream of accumulating enough capital in three years was not realized, so he remained another year and another until the war broke out and then, of course, it was impossible for him to return home. However, he did accumulate some money which he sent home to us. We bought land, a farm down in the lower part of Shekh Hadji which we rented to a farmer. At the end of each year we got a share of the crops the farmer raised. As it turned out, it was a good thing my father never returned to our village. WWI started, the genocide started and if he had returned he would have surely been killed. Other men in the village beside my father were also craftsmen – that is the Armenian men. I am only talking about the Armenians because the Turks were not craftsmen. The Turks were a fighting people. They served in the army and held all of the government positions. (Armenians were not allowed in the army or any other official position). In our area at least, there were very few Turkish farmers or craftsmen such as shoemakers, jewelers, weavers, dyers, and the like. The craftsmen were all Armenian and in my particular village, we had all of the crafts. We also had artists who would go from village to village to decorate the churches. As a child I used to imagine what beautiful work they did. 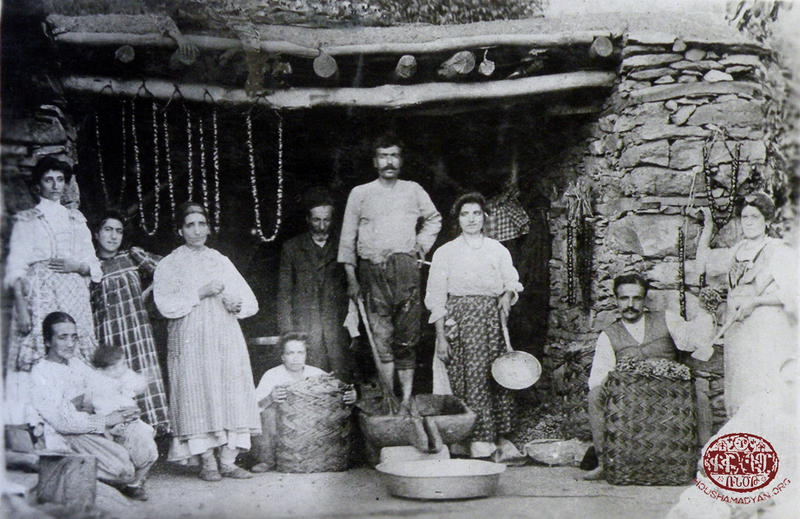 There were about 150 families living in our village and we maintained our traditional Armenian ways and customs. We spoke only Armenian. One never spoke Turkish unless out earning a living or talking to Turks. We had our own churches and schools. This small Armenian community I speak of was divided into two denominations: the Gregorian or Apostolic Church which was the original Armenian Church that went back to the 4th c. when the Armenian king adopted Christianity, and the Armenian Protestant church which was established in the mid-1800s after failure to reform certain aspects of the Apostolic Church. The Protestants had a tough time getting started but by my time, they had already established a church in my village and had their own school as well. Just about all of our family was Protestant. 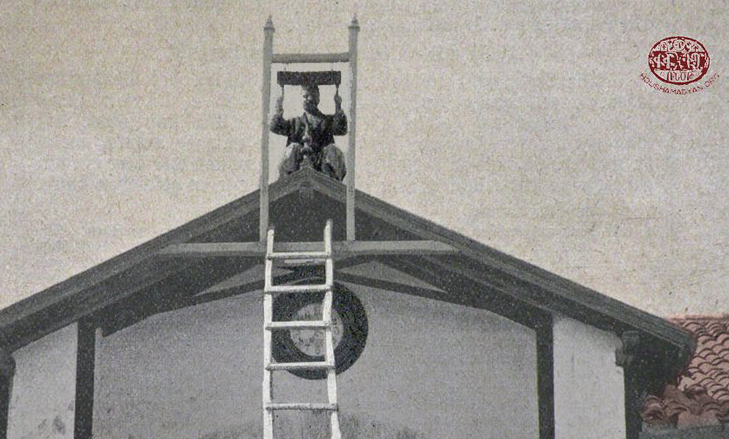 The call to church on Sunday mornings was made using a piece of iron which had a coil on each end. I would like to describe how it worked. The piece of iron and these coils were taken to the top of the church roof where there was a stand made for it. Each coil would be attached to a hook on the stand. The whole thing was suspended horizontally. 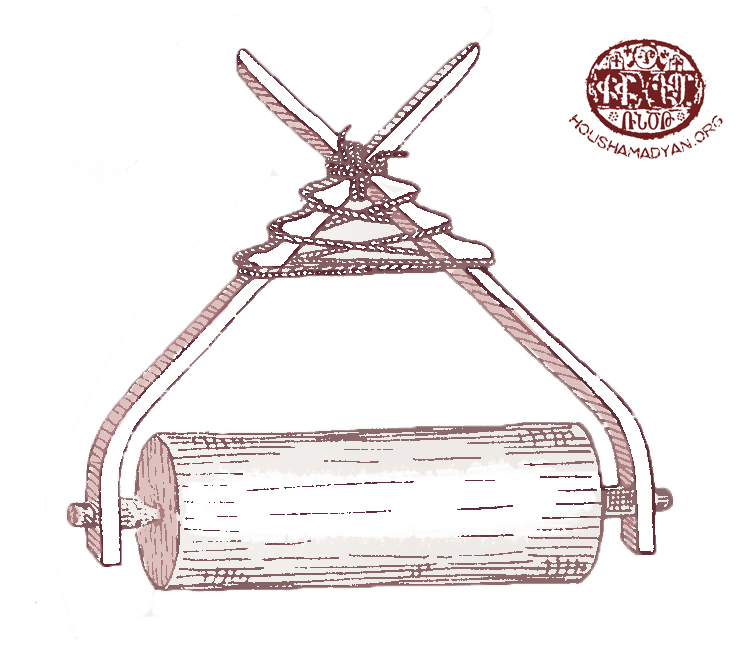 There were two hammers and the men would beat the suspended iron with hammers in a rhythmic manner. This was the call to church and it was called the gochnag. The Protestants and the Apostolics both did it the same way. There were no pews or seats in the Apostolic church which meant you stood through the whole service. In the Protestant church building, called a joghovaran (meeting place), there were pillows to sit on. When you entered the church, you removed your shoes and put them on a shelf. As for education in our village, our elementary school went up to the fourth grade. We had one big classroom where all of the classes were held. I don’t know, to this day how the upper grades were taught. I know that in my grade I had an alphabet book, a little spelling book with little phrases and things of that sort which were taught. That is about all I learned. By the time the end of the summer came, I forgot everything I was taught anyway and then, when school started we began all over again. The Turkish children went to their own school. There was very little interest in education among them. They would gather the Turkish children outside in an open lot and sit them down there. The teacher would talk and read out loud to them. The Turkish children would then repeat things after him. We used to listen to them every once in a while. In addition to all the crafts in our village, there was one other important occupation which was not a craft, but was very important for us. It had to do with bees. We had a lot of beehives. In fact, my village was known for making honey. Practically every home had some hives so bees were around you all during the day. We found it interesting to watch the way the beehives divided. The queen bee would leave when a beehive grew to a point where separation was necessary. She would go and settle on one branch of a tree and all of her followers would settle on the same branch with her. It would look almost like a bunch of grapes hanging there but they were all bees. 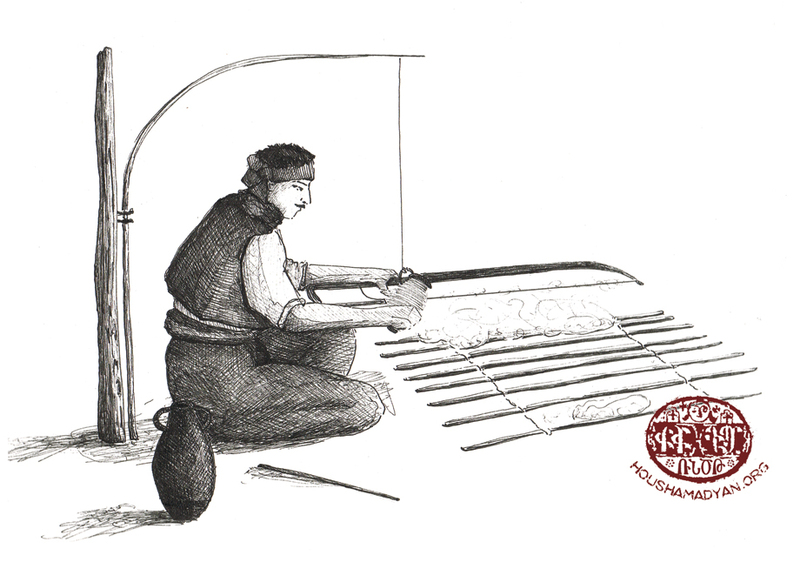 The villagers would have something that looked like an apple-picker’s tool, a big stick with a bag at the end of it. They would go and just try to get that whole bunch of bees in the bag. They would then take it and try to put it into a hive that was already prepared for the bees and the queen. If they succeeded, they would have another hive where honey would be produced. There were homes that had three to four hundred beehives. We would be sitting there in the village and people would be walking around watching the beehives in case they started to separate. When the hives did separate, the villagers knew how to direct the bees so they wouldn’t fly away. Unless they were carefully directed, they could fly away from the village and settle on top of the mountain or some other place where they might be inaccessible. If you lost a hive, this was considered a great loss. When you were able to keep the bees, it was a time to rejoice because you had increased your wealth by another hive. At the end of the season in the fall, they would open the hives and take out most of the honey. The honey would be stored and if there was excess it would be sold. Now if there were any families in the village without hives or money, you were obligated to give some honey to them. Everybody did this and these families had almost as much honey as everyone else. 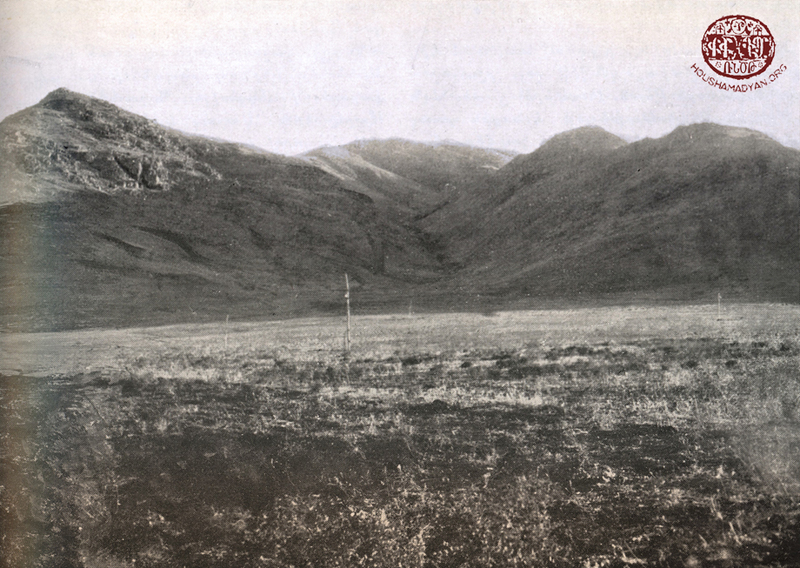 Some of the villagers owned farms and wheat lands which were down below at the foot of the mountain. Actually from my village you could see all of these farms and families in the valley below. The Euphrates River passed right through this farmland and we had the most beautiful view you could possibly want to have. If you owned a farm and you lived in our village, you always gave the farm to someone else to take care of it for you. At the end of the season, he gave you a certain amount of what was grown and harvested and he kept the rest. That was the deal that the villagers made with the families down below in the valley. Each family had some kind of an animal, livestock enough to meet their needs such as a cow or a goat. There were also many donkeys and they were used for transportation. We had a cow and a goat. In the village there was no grazing land so each morning the villagers would released their livestock and the shepherd would take them all down a winding path about three miles down into the valley to the pastureland for grazing. At the end of the day, toward evening, like clockwork they would return up the winding path. The herds of animals formed a picturesque sight as they began the climb back up to the village. When they got into the village, each animal would head for its own home without being prompted – they knew exactly where to go. As I finished telling you this story about the herd, I was reminded of an incident that happened one summer when I was about 6 or 7 years old. I was playing with my cousin Tom who had come from Mezreh to spend the summer with us. We decided to walk down the path to meet the herd as it was coming back to the village – something the boys liked to do. We hoped to get a ride back to the village on one of the animals. I found a mule and jumped on its back hoping for a good ride. But the mule was stubborn and wouldn’t move. My cousin stuck a thorn under its tail to get it moving. The mule kicked up its legs furiously and threw me off its back over his neck. I landed on the ground hitting my chin on a rock. It started to bleed profusely and I began to cry. It was very painful and the sight of blood scared the life out of me. I remember hearing a Turk standing near us say that he knew of someone who had died from a similar accident. I half-believed what he said and was frightened. Someone suggested that a piece of clove should be burned and the ashes rubbed on my bloody chin to stop the bleeding. They did that and it did stop the bleeding, but the pain was still there. When I went home, I headed straight for bed. At suppertime mother wanted to know why I wasn’t at the table. Tom was forced to reveal the fact that I had an accident. My mother came and got me right out of bed. She took me to one of our neighbors who had gone to the American College Hospital  in Mezreh and had learned some first aid methods. He immediately cleansed the wound, put a salve on it and made it much better. We were not supposed to do this kind of thing and that is why whenever we got into this kind of trouble we would try to hide it as much as possible. My mother and grandmother were very strict with us and did not like it when these kinds of things happened. Most of the houses in our village had walls made of brick but not the kind of bricks you find in America. It was a much weaker brick which was dried in the sun. Some of the walls were made of stone. The roof consisted of heavy lumber, logs or branches on which was poured a clay mud. The mud was then rolled and hardened. Whatever the composition of this mud, it really held up very well, prevented leaks, and kept the elements out. Each house would have a very heavy stone roller on the roof just like the ones that are used for making new lawns where you seed and roll it. These stone rollers were called logh. The villagers would roll all the roofs and pack them down so that it would maintain itself in this way. The roofs of these houses were used as patios. The occupants could walk on them and hold social gatherings like dances there. They even made fires on the roof and during the summer months would sleep on the roofs. They would spread the mattresses right there on the open roof and sleep. Our house was one of the nicest in the village, built by my mother’s two brothers who were master carpenters. When they moved to Mezreh my father bought the house from them. It was similar to the other Armenian houses in our village except the rooms were larger and had two levels. As with the other Armenian homes in our village, we had a big kitchen with an open fireplace called an odjakh where all of the cooking was done and a special oven, called a tonir, for baking bread. There was an inner room which was used in the winter and outer closed porch used in the summer. The winter room had a potbellied stove with a flue that extended through the room and out the window. With a fire, the stove would really heat up and warm the whole area. The houses also had barns where the cows, mules, and other animals were kept. We ate our meals at a table which was set low to the ground which meant that at meal time, we sat on cushions on the floor. The utensils were all made of wood, even our spoons and forks were made of wood. Generally, a big dish of food was placed in the center of the table and we all ate from the same dish. I remember when my mother used to milk the cow she would pass the vessel she used to put the milk into around to us and we would drink part of the milk. I remember it being warm and very tasty. In the evenings, the mattresses would be set up, the bedding would be spread out, and we would go to bed. In the morning, all this bedding would be rolled up and put away in a closet. I could sleep on the roof without any worry that rain would force us to hurry indoors. Only occasionally were there thunderstorms. The seasons were fixed. The winter season was winter and the summer season was summer. During the summer we didn’t expect any rainfall. The summer was dry and sunny, so much so that things could become dehydrated very easily under the hot sun. Sleeping on the roof and gazing at the sky was one of my fondest memories about living in Shekh Hadji. The sky would be clear and blue during the day, and at night all of the stars could be seen. Later on in my life as I travelled through other countries it seemed that I never saw as many stars as I used to see in my childhood looking up at them from my bed. The air felt clean and everything was visible as I lay in my bed going off to sleep. I remember seeing some falling stars also. I began counting stars and wondering what was going on up there in the heavens. As you think back and remember your thoughts as a child, you seem to think that the world is only as far as you can see and that whatever you see and perceive is the whole world. We lived on the west side of the village and that would be on the right side as you’re looking down into the valley with the waterfalls in front of it and more waterfalls in front of them. In front of the waterfalls was a mountain range which practically came up into the center of the village. There was a big mountain there. At night the moon would come out and almost stand on top of that mountain. I remember many nights when I used to imagine climbing up the mountain and standing on its top. If I could do that I would be able to touch the moon or maybe even catch it. It is so vivid in my memory. The sight was so beautiful. These were my childish remembrances of my village and constituted my whole world until it all came to an end. 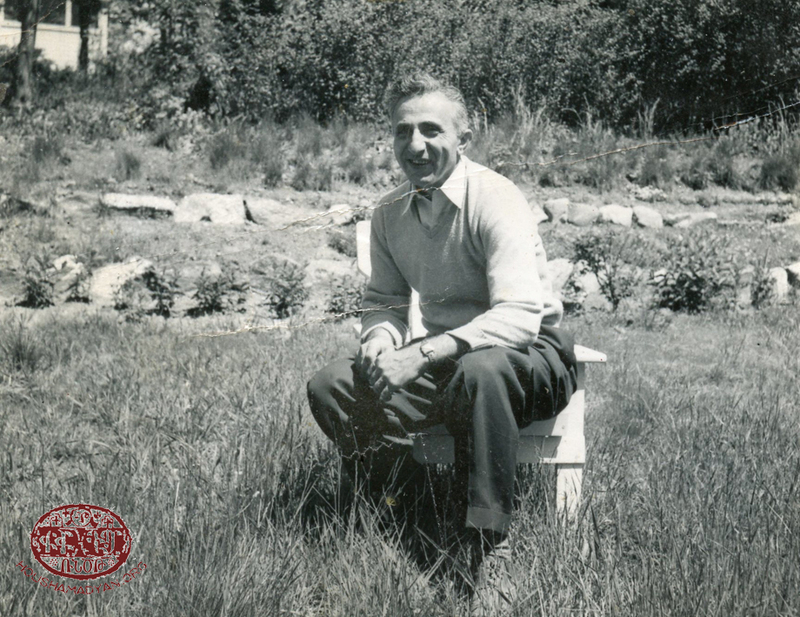 Many years later in the United States, I was given a beautiful description of our village by Krikor Krikorian, a grand old man of 95 years. He still had all of his senses about him and his memory was clear. He described my village as one of the most beautifully situated in all of Kharpert. He said, “ It seemed like the village was sitting on the lap of Buddha and Buddha was sitting there proudly with his back leaning against the mountain, Mastar (which is 9000 ft above sea level) [2743 meters]. And below Buddha’s knee were all of the gardens where the most luscious fruits and vegetables grew.” He talked about the weather, the view from our village, the Euphrates River, the valleys, the waterfalls, the flour mill, and all of the other things our village had. He talked about the grapes that were raised by the Kurds in the village of Shaksnaval, not far from our village. He said that most of the grapes were sold or rather exchanged for services in our village. He confirmed my own impression of Shekh Hadji being a village of craftsmen. He said that other villagers came to our village for services or goods. As I said earlier, our house was one of the biggest and nicest houses in the village. Because it was, we would have a lot of guests – visiting preachers, missionaries, and other church officials who would stop at our house and spend a few days and nights there. Back then it was customary to treat guests royally and so many provisions that we stored for the winter were kept just to serve to guests. For example, when we took honey out of our hives (of which we had 28) the lightest honey which was considered to be the best was stored in a separate jar and kept for guests. Sugar, too, which was scarce, was also kept for the same purpose. It was a very happy time for children when guests arrived because the best that was available was brought out to be served. Most of the fruits and vegetables we grew were preserved for winter use. For instance, we had a lot of mulberries. They would be gathered and cooked to make a loose pudding. You would then spread it on a white sheet and peel it off after it dried. This was called basdegh which was like candy. We would also take our apricots and plums and dry them in the sun. Even yogurt which we made was dried in the sun, shaped into lumps that became as hard as rock – thus preserved for the winter. There was a waterfalls in our village which was very high – I think about 300 feet [91.44 meters] high. The water was channeled so that it would come and pass in the form of a good-sized stream through the lower part of the village. It was used to irrigate the gardens that were on the slopes going down into the valley from the village. This water was apportioned and designated so that each garden had a certain day and hour when they could turn on the water and use it for irrigation. In this way each family had its share of the water. When the water was not in use, it went down into the valley and turned two water mills. The houses in the village had no running water. The villagers had to go to the stream and get the water with pails or earthenware containers and carry it home. Clothes to be washed also had to be taken to where the water was running through the village. The wash was done there and dried in the open, folded and then brought home. I remember some of the customs in our village and would like to mention a few. Many of these customs and legends had been left over from the pre-Christian era. There were some pagan customs that were still in practice such as the fire worship days. There was one holiday when a big bonfire would be made. The whole day would be spent preparing for the bonfire. People would dance in groups around the fire until late at night. It was a real festive day and we really had a beautiful time doing it . Another day that was associated with the pre-Christian era was a day called Vartevar. At this time, people threw water on each other. Now this was a cleansing day or whatever . Again, great significance was given to this day and it was awaited with much anticipation and expectation as a real joyous day. We threw water on each other and we just had lots of fun waiting to see who was going to get wet the most. There was another day that was commemorated with great effort and joy. This day was called Paregentan. On this day, many costumes were worn, particularly depicting animals. This was also a great day for us. People came out with all kinds of animal costumes, danced, and had lots of fun. Another custom that came at Easter time and was obviously associated with the Christian era. It came on the day after Easter and was called Easter Day. All kinds of colored eggs would be brought to a large gathering place in the village where people would come on such occasions. The people would begin to break eggs with each other and see who was going to be the winner. Some of the villagers practiced deception in these contests. They would crack open the end of the egg and fill it with lead. They would then cover up the egg in such a way that no one would ever know the difference. They would actually enter the contest with an egg like that. But eventually they would be discovered and there would be a little trouble. On that day they also had a lot of sticks painted like barber poles and there would be a contest as to who had the most decorative stick or pole. Again, it was a big show for us with great festivities. We celebrated New Year’s Day or as it was called Gaghant. On this day, the children used to take a bag or a stocking and lower it from the skylight into the homes in the village. The bags were supposed to be filled with raisins, basdegh, rodjig , nuts, and sweets. It was great for the kids to go around and do this. On New Year’s Day, I remember going to my uncle Hampartzum’s house which did not have a skylight so I lowered my bag down their window. Haiganoush, a distant cousin, was living with him and his wife at the time. The two women and my uncle knew the bag was mine and as I pulled it up out of the window I could hear them laughing. I stuck my hand in the bag and felt onion peels on the top. I didn’t go further underneath to see what was there. I got angry and lost my temper because I thought they were playing a joke on me. I had high expectations but I thought they had filled my bag with onion peels. I took the bag and dumped the whole thing in the street. I realized too late that at the bottom of my bag were all the sweets – the rodjig, the basdegh, nuts, and other good things. I was really sorry at what I did but it was too late. I would like to describe our village life in more detail. In the evenings, families visited each other whenever there was a particular chore to be done. They would all get together and do the work. In the meantime someone would be telling a story then later, they would have some sweets. When it was time to go to sleep, everyone would leave and retire to bed. This custom was especially helpful when the cotton nuggets were brought from the farms to the village. It was a lot of hard work pulling the cotton from the nuggets. After this was done, the cotton was then softened, beaten and fluffed up. There was a man who came around to do this work. He would fluff it up using a bow and arrow. He would continue doing this until it was fluffy enough so that it could be spun on a spinning wheel. This was the time they called kashelou jamanag (literally – the pulling time!). 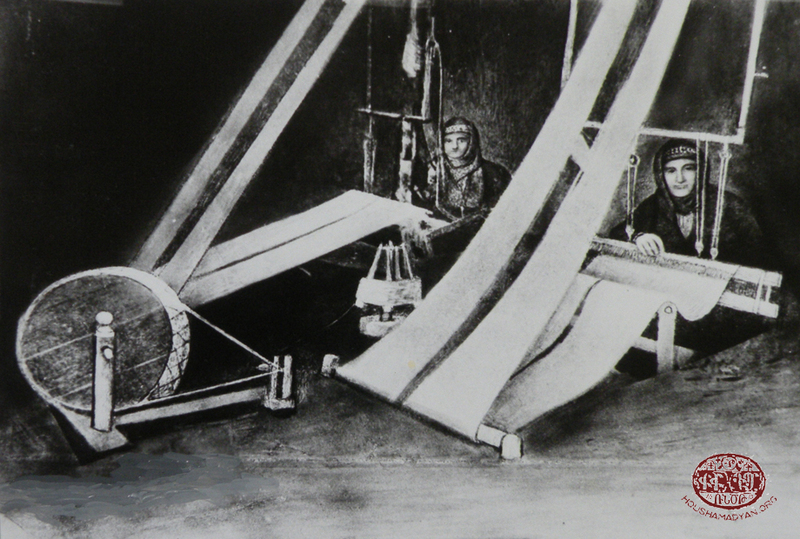 After the cotton had been fluffed up, women spun the cotton into thread using very old spinning wheels. The wheels would spin and all of this thread would come out. It was very interesting watching the grandmothers spinning these wheels. Cotton picking time was enjoyable because everybody would participate including the children. I had done this many times. There was no poverty whatsoever in our village. It was primitive but there was no poverty. Those who didn’t have it, and by that I mean food and the other necessities of life, got it from those who had it. Giving was voluntary because it was considered a moral obligation. If a family did not have a father and had a child or children to support, it was well-provided for. When the wheat was harvested, they received a portion of the wheat. When syrups were made or honey collected from the hives, they got a portion of whatever was collected. As a result, there was no poverty at all. There were beggars who went around the village begging for food but they were not from our villagers because we took care of our own. We gave food to the beggars just as we gave food to our own villagers who were in need. There were also peddlers who would come to the village selling things. They would bring fruits such as grapes and pears, sewing goods such as needles and thread and yard goods. Occasionally we would also get other strangers in town, gypsies traveling in groups telling fortunes. Some people would welcome them and reward them with food. At this point I would like to bring up a fact concerning my family which I believe to be most interesting and unusual. It had to do with faith healing. I don’t know how our family became involved with it but it appears that the male members of the Abrahamian family had a healing role. We were healers in a way, faith healers if you want to call us that. The villagers firmly believed that we had these inherited powers and that we had the power to heal or cure certain types of illnesses. My brother and I were always being called to heal people who had very severe pains in their backs where they could hardly breathe. It may have been a form of pneumonia. There would be a great deal of noise from all of this and the man would say, “Who are you?” I would say, “I am a pain killer.” He would then ask, “Where are you coming from?” I would say that, “I am from the mountain of pain.” He would then ask me what I was going to do. I would tell him that I was going to strike out the pain that was in him. He would say, “But you can’t do it.” I would say that I could do it. This would go on and on with him saying that I couldn’t do it and I saying that I could do it. After all of this, I would hit the cover with much force and a lot of noise and say, “I will do it and in the name of God Almighty I will cut it from you, eradicate it from its roots and you are now free from pain.” I would do all of that and then I would be taken home to bed. If people had this kind of faith, it must have cured quite a few people. Since I have covered most of our village life that I can remember, I would now like to tell you about the form of government which ruled our village. There was the Beg –appointed by the Turkish government, with what I remember was a hereditary title – given by the sultan. The Beg occupied the most beautiful house in the village. I had never been in it nor had I ever seen it. But I understood that it was made of marble mosaics, marble patios, a swimming pool, and running water. Mind you, this palace in that little village of ours was built on the side of this great mountain, Mastar, where a car could not even be driven up its side. Obviously, the marble, timbers, and all of the other building materials had to have been carted up by donkeys and mules. Now the Beg, as I remember, had supreme power over everyone in the village. However, the Armenians also had a leader called khodjabashi [kocabaşı - headman] who was appointed by an official of the Turkish government. He was recognized as the responsible person for the Armenians in the village. It is interesting to note that the annual tax collection was done through him. He determined what each family owed to the Turkish government as tax and what the whole village had to produce to come up with the necessary taxes to be paid to the government. When the tax collector came to the village with a couple of armed police or gendarmes, they went to his house, sat there and waited until whatever to be gathered was counted and given to them. They would then depart. These taxes were often very heavy and the villagers could not always afford to meet these unreasonable demands. I remember one time when the tax collector was not satisfied with the amount that was collected. The Turkish official put great pressure on the khodjabashi to go around again and raise the required amount of taxes. He told them that he did what he could and that was all that he could raise. The collector was angered. The Turkish police whipped him publicly in a very savage and atrocious manner until the taxes they demanded were received. I can never forget that. The Beg or Agha as he was also called, also settled disputes between an Armenian and a Turk or between two Turks. Actually, the Armenian had no voice at all before a court of this sort. If the Turk involved in the dispute put his fist on the Koran, that was proof enough that he was telling the truth. In some parts of our country there was a great deal of real oppression under these petty little rulers. For instance, on the first day of the wedding, the bride had to visit the Beg or Agha before she became a wife to her husband. This kind of oppression was going on in many areas of our country. As a result, many Armenians were looking to the day when they could have their own freedom, and most likely, the Turks were aware of these feelings. I’m sure that they were. In this small village of ours, there was great concern for each other. Because it was a small community, there was much inter-relationship because of marriage. There were first cousins, second, third, fourth and all the way to fifth cousins. You found that people called each other aunty and uncle. Because of this, there was always supervision of the children and taking care of the poor in our village. I had very happy recollections of my village. I think that everybody else was happy and contented until the breakout of the World War I in 1914. At the beginning of 1915 a black picture began to appear. Villagers led a peaceful, happy life in village after village through the Armenian provinces of our ancient homeland. Then, disaster fell on them and that peaceful way of life was broken never to be established again. And those villagers were subject to all kinds of suffering in an effort to annihilate them – to wipe them out as a race from the surface of the earth. 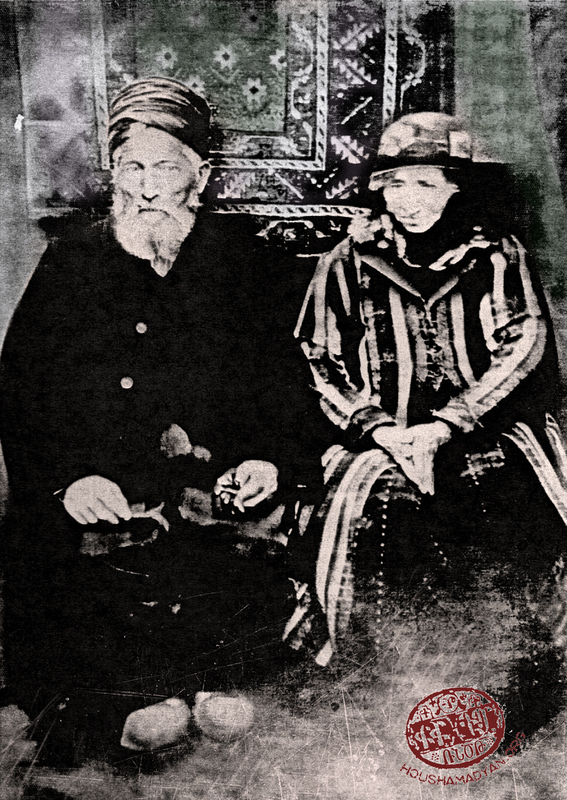 Shekh Hadji or Sheikh Hadji. Two villages with this name existed side by side in the Harput/Kharpert Plain – Upper Shekh/Sheikh Hadji and Lower Shekh/Sheikh Hadji. The former, later called Aşağıbağ, is now submerged under the waters of the Keban Dam along the Eastern Euphrates (Aradzani/Murad River). The latter village has been renamed Yukarıbağ. The Armenians used to call it the province of Harput/Kharpert. As of the mid 19th century it was called Mamuretül-aziz. In reality the “ian” suffix doesn’t necessarily signify the offspring of this or that person but simply rather connotes “belonging”. 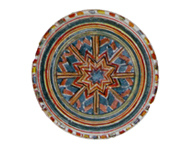 During ottoman times, the official name of Mezre/Mezire was Mamuretül-aziz. Refers to the American missionary hospital established in Mezire (Mamuretül-aziz) by Dr. Tracy Atkinson. Here, the author refers to the Dyarnentarach festival (The Feast of the Presentation of Our Lord to the Temple) that occurs in February. Also known as Meled, Melemed and Derendas. According to the Christian calendar Vartavar is called the holiday of Christ’s Transfiguration. 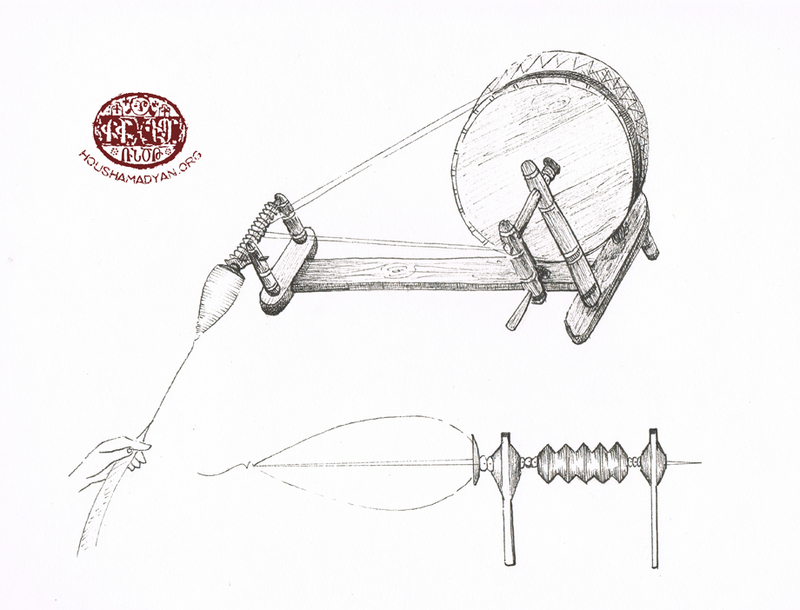 We come across the use of a tonir hook, as a tool to ward off evil spirits, in the memoirs of other Harput Armenians. Begs/beys weren’t appointed by the sultan and didn’t hold state office. The begs or aghas, mostly Kurds, were influential and rich feudal lords or tribal chieftains in this area. The Ottoman central authorities tried to curry favor with these local forces and turn them into levers of power for the state. 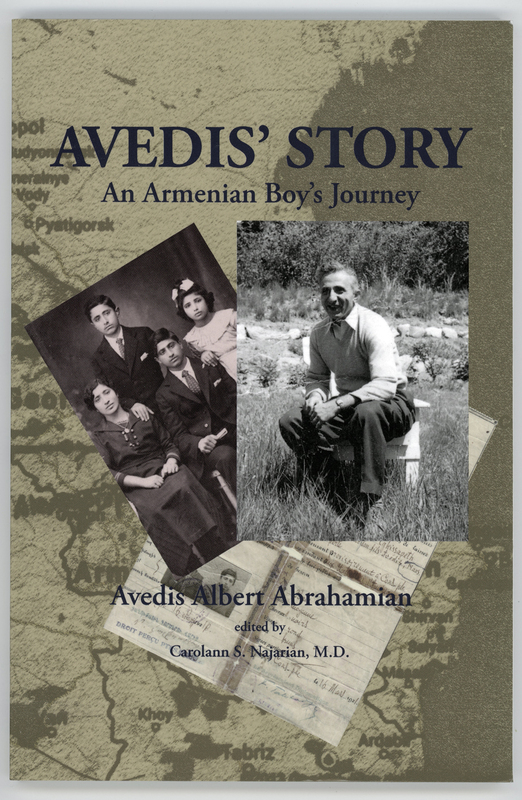 Avedis Albert Abrahamian was about nine years old when he left his native village of Sheikh Hadji (located in the Harput/Kharpert Plain) for good due to the consequences of the Genocide. His memoirs were published in 2014 by the Gomidas Institute in London directed by Ara Sarafian. The first chapter of the book completely deals with the life the author led in Sheikh Hadji until the Great Calamity. The memoirist’s daughter Carolann Najarian, has graciously allowed us to publish the entire first chapter in our website. We are certain you will find it of interest. The attentive reader will observe two principal aspects in this first chapter. First, it is evident that the memoirist relies on his childhood memory to recreate his images of Sheikh Hadji. Second, these passages deal with the period following 1908 - the years after the reestablishment of the Ottoman constitution. The first main protagonist introduced to the reader is Anna badji/bacı (grandmother). Her bravery and boldness clearly assumed epic-like proportions in the mind of Avedis the child, so much so that when he recounts them as an adult, his descriptions of Anna badji lose none of their wonder and awe. Here, as a backdrop, the Genocide also probably comes into play. Grandma Anna’s arguments with her Turkish neighbors are presented as battlefield victories. The scarcity of men folk, in the village and the family, is evident from the very first pages. The author’s father and the other men are absent, having left for the United States. After the reestablishment of the constitution, emigrating from the Ottoman Empire for distant overseas shores had become easier. 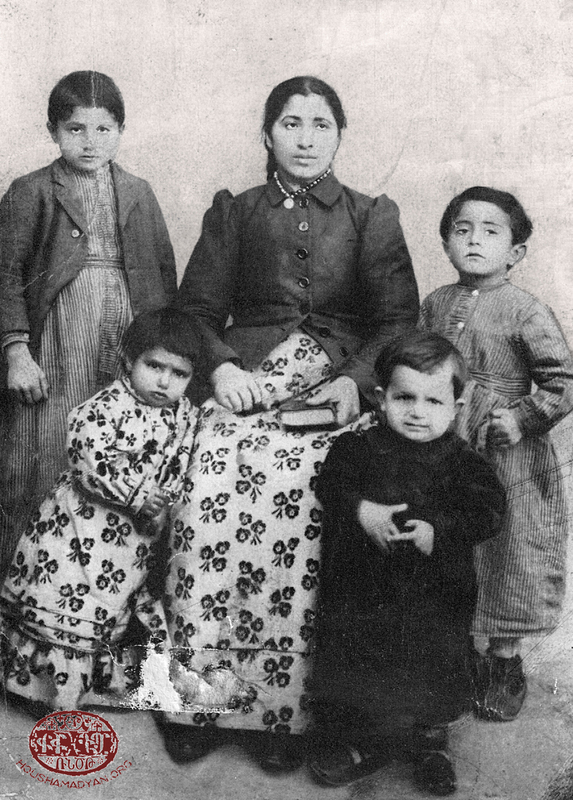 Armenian males, as well as Muslims, left their villages in large numbers; mainly for the United States, particularly to escape military conscription. The post-constitutional period is also known as a time for purchasing land. Buying land or regaining seized property was impossible during the reign of Sultan Abdülhamid II. After 1908, however, we see many Armenians in the Harput Plain and elsewhere regaining their lands that had been seized by local aghas and begs. The small village of Sheikh Hadji had two Armenian schools; one belonging to the Apostolic community and the other, the Protestants. 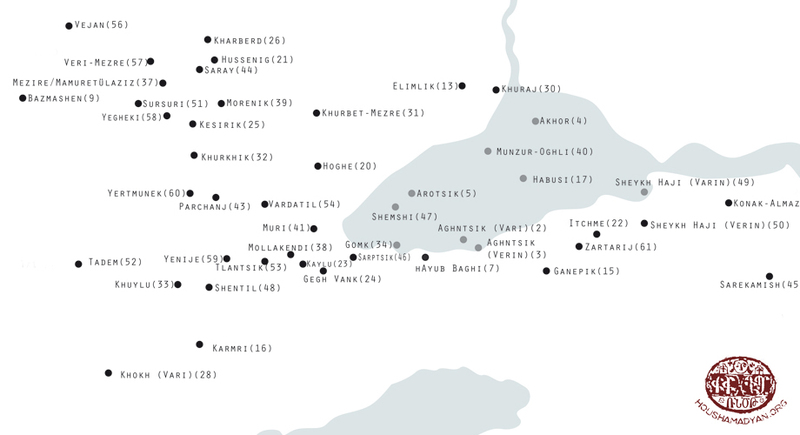 This is further evidence of a developed and developing education network throughout the Harput Plain. Most of this memoir is based on Avedis’ direct experiences without reporting hearsay. However, there are two examples of hearsay in this portion of the memoir: his description of the Beg’s house (of marble and with a swimming pool) and that some places Begs required a bride to visit him before her marriage. Avedis did not have direct knowledge of either and he says so. It is unlikely that in the little village of Sheikh Hadji the Beg had a house of marble with a pool, and there is no evidence to date that Begs in the region required submission by brides prior to their weddings though permission to marry was required. Since Avedis' memoir is verifiable and accurate in other aspects, we can take him at his word that he did hear these things, but that both were most likely magnifications based of the feared Begs whom these oppressed villagers believed to be all-powerful. We’ve made the above observations merely as an attempt to place Abrahamian’s work in its historical context. We know that post-Genocide Armenian memory literature was quite extensive. Putting one’s memories to paper was widespread within that generation. Undoubtedly, each of those works portrays distinct experiences. Each maintains its uniqueness and distinct value. Thus, in the words of Marc Nichanian, each is also a “monument,”; as such, these works of self-narration shed their status as purely factual, archival documents and are invested with new and enduring value. Here then is the inestimable literary work of Avedis Albert Abrahamian in its original English. Marc Nichanian, The Historiographic Perversion, translated by Gil Anidjar, Columbia University Press, New York, 2009, pp. 93-94.